A fifth-generation San Joaquin Valley vine and fruit grower, Victor Davis Hanson is the Martin and Illie Anderson Senior Fellow in Classics and Military History at the Hoover Institution, Stanford University. 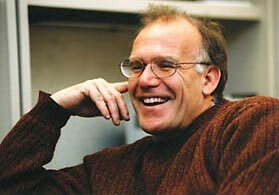 He is a recipient of the National Humanities Medal (2007) and Bradley Prize (2008). The author of more than fifteen books, he has written for Policy Review, the New York Times, New York Post, Wilson Quarterly, Daily Telegraph, City Journal and many other publications, and he is a frequent contributor to the Wall Street Journal, National Review, Commentary, and The Weekly Standard. He also is a syndicated columnist for Tribune Media Services and a regular contributor to National Review Online and has his own blog “VDH’s Private Papers”. Hanson was educated at the University of California, Santa Cruz (B.A. 1975) and the American School of Classical Studies (1978–79), and received his Ph.D. in classics from Stanford University in 1980. The Washington Post recently referred to him as "One of our premier military historians."